Medtronic’s vascular business is one of its recent success stories, showing revenue growth above most other device areas in its portfolio. Now the company has announced U.S. FDA approval for its so-called Complete™ SE (self-expanding) vascular stent for use in the lower extremities. Complete SE was already approved for use in the Iliac arteries. Now they can add Superficial Femoral (SFA) and Proximal Popliteal (PPA) arteries to the label. Risk factors for peripheral artery disease (PAD) include smoking, diabetes, obesity, high blood pressure, high cholesterol, age (50 or older) and familial history. Typically characterized by an excessive buildup of plaque in the peripheral vessels, the condition can progress to claudication and, without treatment, to critical limb ischemia, which often leads to amputation and premature death. Among treatments used to restore and maintain normal blood flow in patients with peripheral artery disease, are stents from a variety of manufacturers. One such is Medtronic’s Complete SE which incorporates a dual-deployment handle and a triaxial catheter. The company claims this provides physicians with exceptional deployment accuracy, while also minimizing unexpected stent jumping. According to a press release, issued by Medtronic, the FDA’s approval of the new SFA and PPA indications was supported by the results of the Complete SE SFA study. This was an independently adjudicated single-arm, multicenter trial that enrolled 196 patients at 28 sites in the United States and Europe. The study showed a clinically-driven target lesion revascularization rate (or “need for re-do”) of only 8.4 percent at 12 months, which it says is among the best reported in clinical trials of contemporary self-expanding peripheral stents for the treatment of SFA/PPA lesions. Find out more about the clinical results in the press release, here. 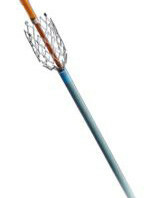 The Complete SE stent also carries the CE marking for iliac, SFA and PPA indications.